Birds cause problems when nesting in barns. Those problems range from a high noise level to an infestation of mites. Birds, such as woodpeckers, cause structural damage to the barn, not to mention the mess they cause from "droppings." 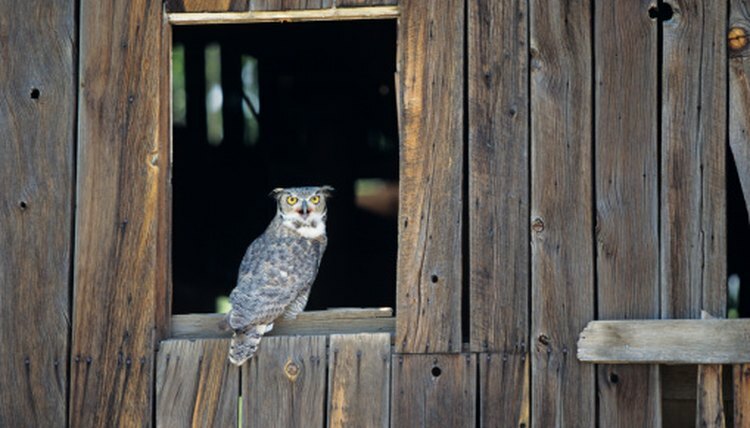 Several humane options provide methods that keep birds out of barns. The humane deterrents help keep the animals and livestock safe, while keeping the birds out without causing them physical harm. Place bird netting over the rafters to prevent birds from setting up a home. Add spike wire to the rafters and other areas of the barn where birds land. Birds cannot land on it, making the birds less likely to stay in your barn. Place a sound machine in your barn. Select a predator sound or one emulating an injured or frightened bird to scare birds away from the barn. Cover landing sites with a perch repellent. Paint the repellent on the wood or metal structure, making it uncomfortable for the birds to land. Place pinwheels, mirrors, aluminum pie tins or strips of black plastic on the rafters. Movement deters birds. The Colorado State University website recommends using at least two of the devices at the same time for the best results. Spray a bird repellent containing methyl anthranilate or an additional chemical that deters birds. The odor drives birds out of the barn. Follow the manufacturer’s instructions when applying the repellents. Test them first in hidden areas as they may stain wood. Sound machines operate on batteries or through an electrical outlet. Purchase a perch repellent from a local farm-supply store. It comes in the form of a gel or sticky substance. University of Florida; Pigeons; William H. Kern, Jr., Ph. D.